Some of my best travel experiences have involved exploring local markets; I love them in so many ways. Some of my biggest travel disappointments have also involved markets, including a few which are considered famous/”bucket list” experiences. 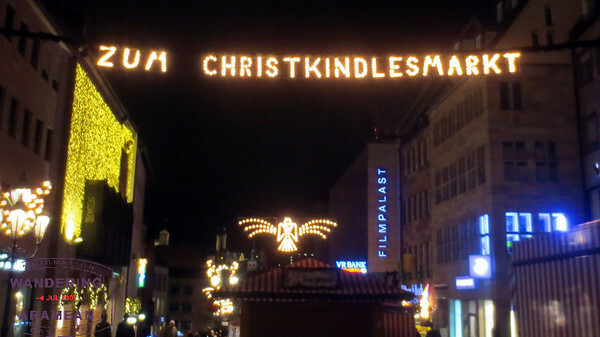 When I booked my trip to Germany to explore a couple Christmas Markets there I was not quite sure which end of the spectrum the visit would fall at. Maybe I shouldn’t be too surprised that it was a bit of everything. My trip was a last-minute affair. I booked the flights 10 days prior to travel, mostly because it was too good a deal to pass up and I’ve always heard such good things about the markets. And then, as I explained to friends my plans, they reminded me that the markets were all about Christmas (not really a holiday I celebrate) and that they were markets about shopping (not something I willingly do much of). So what the hell was I thinking? How would the trip play out? With only two nights available in Germany on the trip I had to be somewhat aggressive in budgeting my time. I was flying via Frankfurt but wanted to see more than just one city and wanted to maybe even visit with some friends if possible. The trains were able to get me back and forth for 29 euro each way and the timing worked such that I had a pretty solid itinerary once I finally worked out the details. 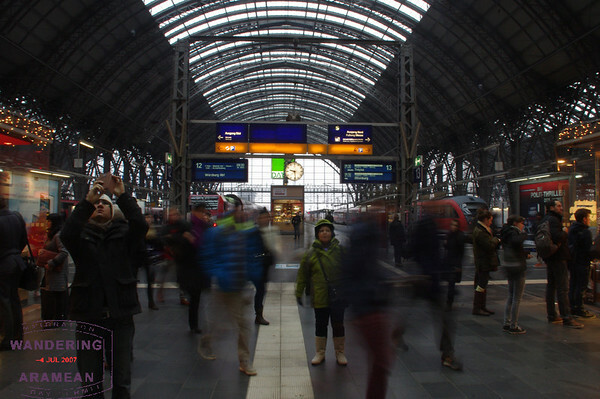 I would visit Mainz (just west of Frankfurt, about 30 minutes on the local train) upon arrival and then head to Nuremberg the following morning. A full day in Nuremberg – considered by many to be the original market location – and then back to Frankfurt Airport the following morning and straight through to my flight. Yes, a bit rushed, but I actually ended up with more time than I probably needed in each place. I think I could’ve seen more if I wanted to. I like Mainz as a town. It is compact, has lots of pedestrian-only areas and is relatively easy to navigate. Add on the riverfront area for a nice walk (though more in the summer than winter) and proximity to Frankfurt airport and it is an easy, nice destination. Add in the market and I figured it was a huge win. My flight landed on time which meant I was in town a bit early, too early for the market. It was interesting to me to walk around briefly and see things before the crowds showed up; much calmer, to be sure. Later in the evening, however, there was nothing resembling calm. 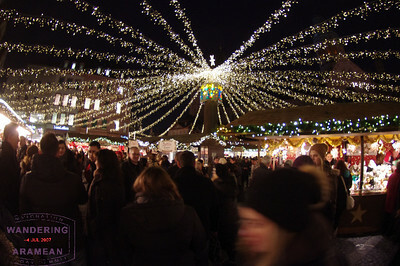 The market was packed with locals and tourists alike (I heard plenty of English spoken, but much more of that in Nuremberg), all enjoying the cool evening and seasonal celebration. Yes, there is shopping in the market. Lots of stalls with tchotchkes of all shapes and sizes. Some of the things were reasonably pretty but most of it was stuff I’d avoid at all costs. From that perspective the market was a disappointment. On the other hand, unlike similar markets in New York City or elsewhere which I’ve visited, the markets in Germany have other components: food & friends. I was probably the only person visiting the market on my own. Everyone else there seemed to be in a group, often a large group. 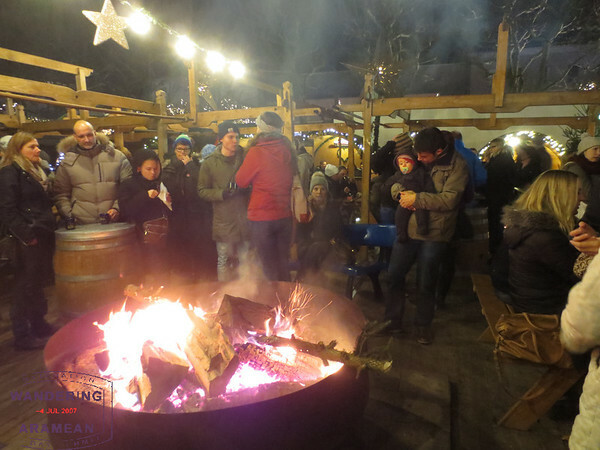 They were huddled together, sipping the glühwein (warm, spiced wine – I understand it to be an acquired taste) and thoroughly enjoying their evening out and about. This is the type of market experience I enjoy. The market exists not because everyone necessarily needs the stuff being sold there, but to help bring the community together and to provide a focus point for interaction. 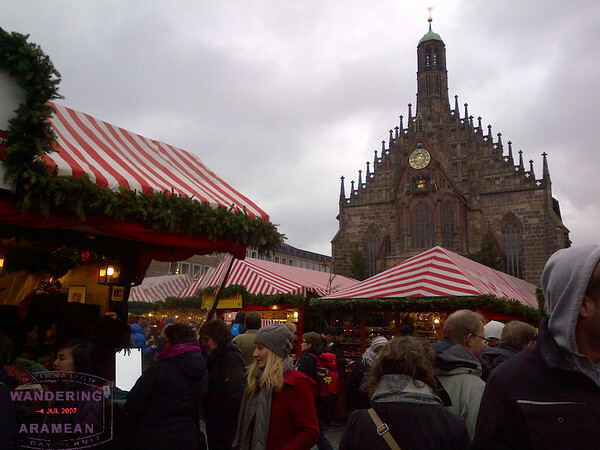 In Mainz the Christmas Market did exactly that. I also had a bit to eat, sampling from a couple different stalls. It was the 8th night of Chanukkah so I considered myself quite lucky to find potato latkes being served. They were delicious, as was the grilled meat (of indeterminate origin, thanks to translation issues) sandwich I had from another stall. And then the jet lag kicked in. I was off to bed, with an early wake-up call the following morning to catch the train to Nuremberg and another market experience. 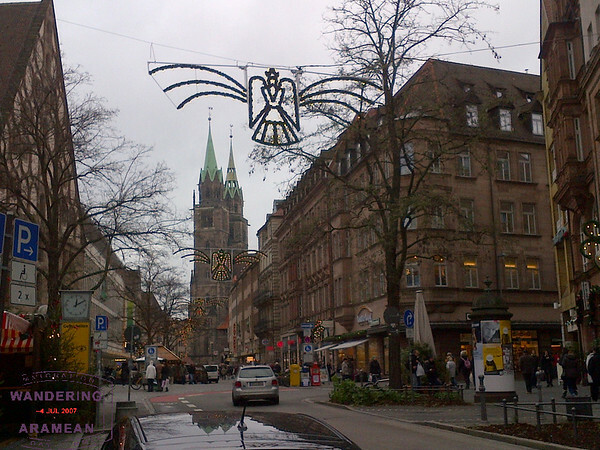 Arriving in Nuremberg I was convinced that things could only get better from the day before in Mainz. After all, not only was this town actually famous for its market, but the scene leading out from the train station towards the market area was all about the celebration. Then again, maybe I should’ve taken that as a warning sign. I made it to my hotel, dropped my bag and wandered into the market. One review I read noted that the local council is strict about the types of products sold and the provenance of the goods. I suppose this set my expectations a bit too high. The town was quaint and the market was cute. But it was also ridiculously crowded in the evening and, quite frankly, the goods for sale didn’t seem all that special or local to me. 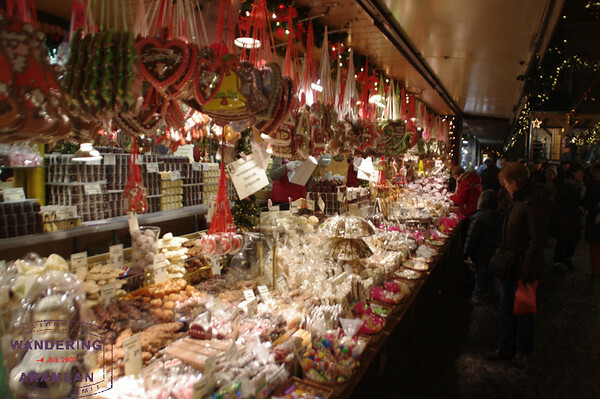 The traditional Christkindlesmarkt goods – gingerbreads and such – were readily available, as were all sorts of other things. Nuremberg’s (recent) history as a center for toy manufacturing was represented a bit, but not as much as I hoped. OK, but I’m not really into shopping anyways, so that shouldn’t be as big an issue, right? 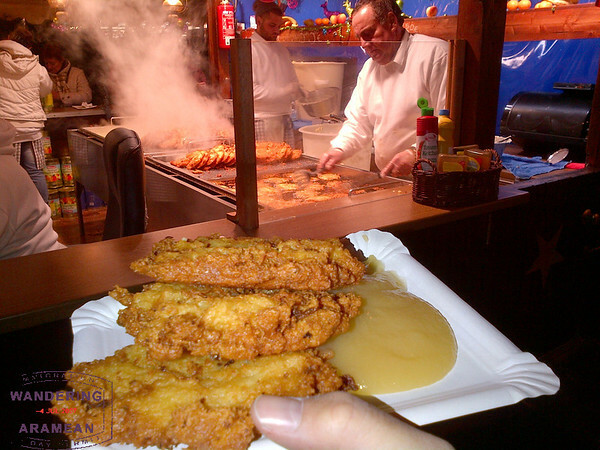 Turns out that the bits I do enjoy – the food & friendships – were also rather more challenging in Nuremberg. There was one area which was essentially a food court, with some open space and lots of people eating from the shops in the area. That was good, though ridiculously crowded. Many of the grills were offering up Nuremberg Sausages, a local specialty which has been a protected product under EU law since 2003; only meats actually produced within the city limits can claim the name. There is a lot more history – 700 years worth, in fact – but the modern version is that they are delicious. I ate many of them during the day and more at dinner when a couple friends from Munich came up for a meal at Bratwurst-Glöcklein; the market itself was too crowded to deal with. There are scores more options for markets to visit in Europe (mostly Germany, but other places, too). Many are in smaller towns where the crowds are notably reduced and the focus is even more on friends and family rather than shopping and tchotchkes. With only two days to explore on this trip I didn’t get to experience enough of those. Next time (assuming there is one) that will be the focus of my trip. The “big” markets are OK, I suppose, but if you’re looking for the more intimate “local” experience then skip ’em. 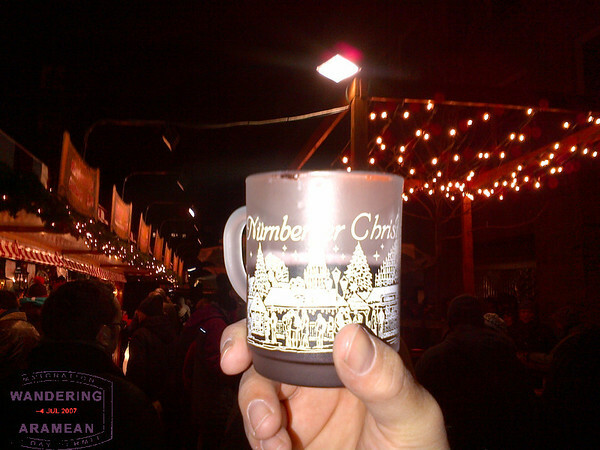 Also, if you want a souvenir from the markets the mugs you get for the glühwein include a 1 euro deposit. That’s a cheap price for a take-home trinket. More photos available on Facebook or Google+. I love your descriptions and photos in this post. They really capture the essence of the “Marche de Noel.” I’ve been to the one in Strasbourg, France, which has been held since 1570 (!) and has a similar feeling to the one in Mainz; I’ve also been to others that weren’t as special/memorable. Thanks for the great post – enjoyed reading it. You made it really easy for me to picture what the markets were like. Great photos and descriptions! 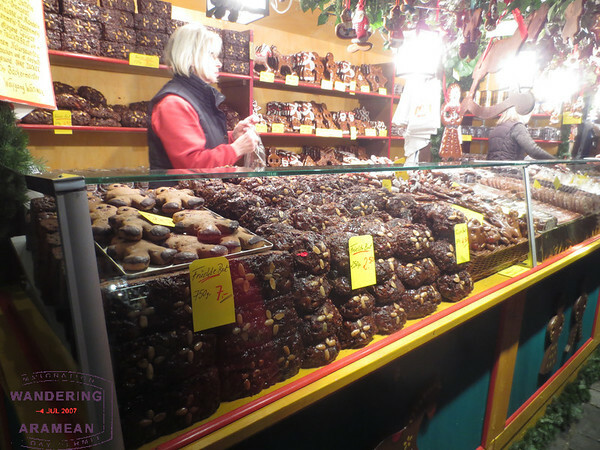 I’ve never been to the German Christmas markets, but the one in Mainz sounded more enjoyable than the one I went to in Madrid and I otherwise never would’ve given Mainz a second thought as a potential place to visit. Thanks for opening my mind a bit. Cool trip report! So far I’ve only been to one – two years ago the family and I ventured to Cologne on a day trip from Amsterdam – not just for the Christmas markets but that was part of it. What a wonderful time! There were, I recall, 3 or 4 market areas in the city, with one being primary (right beside the cathedral). We actually found some nice buys and yummy food & drink. I kept my gluhwein mug, too! Mainz is where I grew up, where my family still lives, and where I still visit often. 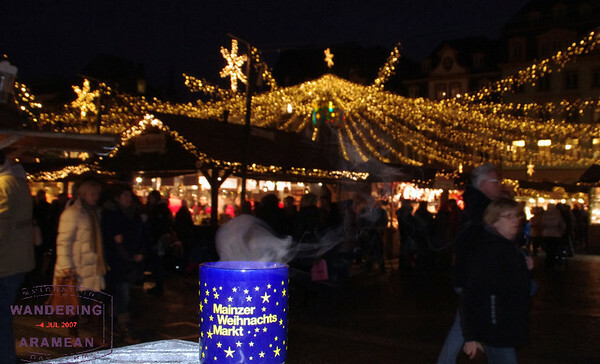 The Mainzer Weihnachtsmarkt is indeed one of the nicer ones because of the community spirit you picked up on. 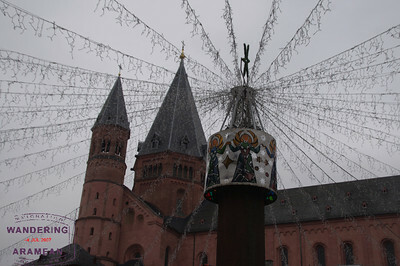 One even better Weihnachtsmarkt is the one in Heidelberg, and the one in Trier is worth seeing, too.